As the war clouds disappeared from the horizon, members of Melbourne’s Preston Motorcycle Club began casting around for a suitable site on which to unleash six years of pent-up need for speed. About eight kilometres from Bacchus Marsh, near the little town of Darley, lay an abandoned army training facility – Darley Camp – built on a plateau with a backdrop of rolling hills. When the military moved out, most of the infrastructure, such as it was, went too. The buildings were dismantled and carted off, exposing an interesting network of bitumen roads that stretched around the rolling grasslands. Such was the army’s devotion to duty, even the pipes that had been laid under the roads were ripped up, leaving open trenches around the complete 2-kilometre ‘lap’. A few concrete pads remained, scattered about the site. Each weekend, Preston club members would gather with whatever implements they could muster, filling in the trenches an eventually re-coating the road surface with tar, clearing scrub and removing piles of rusting junk. Eventually, a pretty little facility was in place, and by late 1947 the club was optimistic enough to forecast a date for the first open race meeting – February 29th, 1948. Two weeks before this, Preston MCC invited Hartwell and Kew clubs to a shake-down day to test the new venue before the public were admitted for the first time. As it transpired, rafts and canoes would have been more suited to the conditions, after some of the heaviest rain ever recorded in the area virtually flooded the surrounding countryside. Because of its slight elevation, the circuit itself withstood the deluge well, and when the rain abruptly stopped at 11.30 am on the Sunday, practice was able to get under way soon after. Apart from a delay caused by an accident during the practice session, the day went off smoothly with the first lap records being attributed to Harry Rosenthal (Solo 1 minute 24 seconds), and Bob Rowland (Sidecar 1.34). Darley was pronounced ready to host its first open race meeting. With the cancellation of the Victorian TT at Ballarat, scheduled for Easter Monday, Darley’s entry swelled to capacity. The main straight, which had a left hand kink in the middle, was only as wide as a normal two-lane road of the day, while the rest of the track was even narrower. It made for shoulder-to-shoulder racing on solos, and even closer encounters for outfits. The first open race on the circuit was the Darley Lightweight TT for solos up to 250cc and was a benefit for Bob Elsbury on his neat MOV Velocette. He led from start to finish, holding off a challenge from pre-war star Frank Mussett. On his ex-works 350cc Velocette, Mussett took out the 10-lap Junior TT and was part of a three-way dice for the lead in the Senior TT, eventually won by Lyall Clark on a J.A.P. from Harry Rosenthal. The Sidecar TT drew a quality field, with Frank Sinclair’s 1000cc HRD finding few places where its horsepower advantage could be exploited. By half distance in the 8-lapper, Sinclair was ahead and drew away to win from Reg Rowland’s Ariel and George Murphy’s Norton. 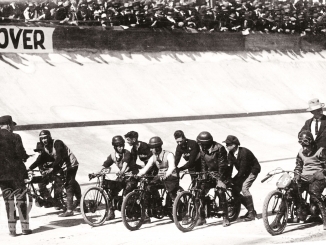 The day’s premier event, the 15-lap Invitation TT, brought together all the stars, with Mussett set a big task from the rear of the field. George Campbell made the early running, but Mussett was flying and was in front after just three laps. Joe Donovan and Campbell filled the placings. The big crowd went home well satisfied with their day’s sport at the new venue, which, despite its casual atmosphere, was destined to become a popular and durable fixture on the Victorian scene. A second restricted meeting, between Preston, Kew and St Kilda clubs followed in June. The miserable winter conditions led to several accidents, notably to Harry Rosenthal who crashed while leading the Senior TT, but recovered to win the main Invitation Race. 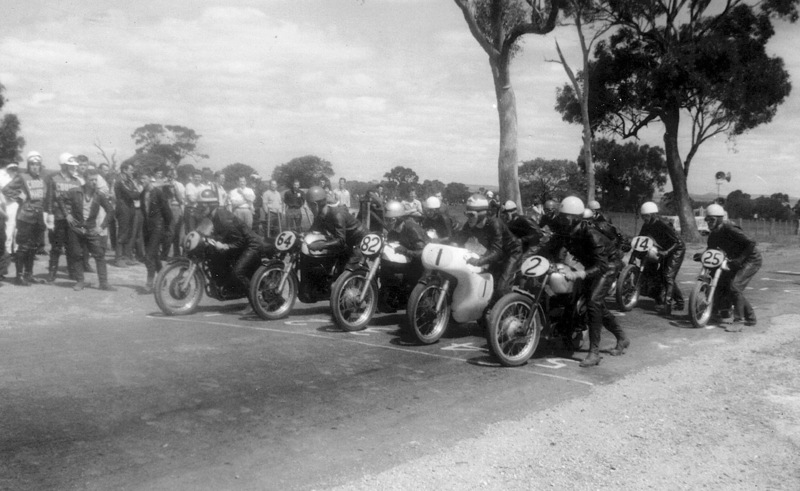 The opening meeting at Fishermen’s Bend in the heart of Melbourne, where the re-scheduled Victorian TT was conducted in August 1948, cemented a boom year for motorcycle sport in the state. Meanwhile, Preston club’s dedicated members continued to labour away at their little patch, and seemed to find a happy niche holding several race meetings a year without chasing the major titles. The venue gained a well-deserved reputation for excellent organisation which allowed plenty of races to be crammed into a single afternoon, giving plenty of outings for riders and good value for spectators. 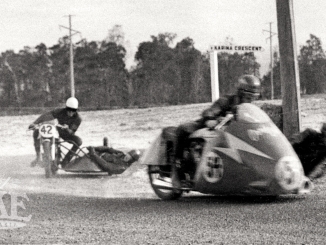 Some names began appearing regularly at the top of the results; young Maurie Quincey starred in the mid-year meeting in 1949, taking three wins in four starts in the Clubmen’s races, while the sidecar events were the domain of Bernie Mack, George Murphy and Frank Sinclair. By 1950 Frank Mussett had retired and Quincey, with his KTT Velocette and Shellsley-Walsh Matchless, was the new star, even defeating the latest ‘find’ Ken Kavanagh, with his Manx Norton, on several occasions. Bert Flood seemed to have a mortgage on the 125cc class with his self-tuned BSA Bantam and Ray Owen’s unfashionable but fast 250 Triumph was a consistent winner in the Lightweight division, always dicing hard with Jack Rudd’s Velocette. An Easter Monday meeting in 1950 allowed riders time to travel back from Bathurst and saw Ballarat’s top rider George Morrison collar a double by winning the Senior and Invitation races. The club settled into a traditional mid-year date on the King’s Birthday weekend in June, which usually meant a cold and often wet experience for people on both sides of the fence. The Easter Monday meeting happened again in 1951, and Quincey, with the Bathurst Junior title in his pocket from the Saturday, scooped the pool at Darley as well, winning both Junior and Senior titles and setting new lap records in both of 1.17. Frank Sinclair slashed no less than six seconds off Bernie Mack’s sidecar mark to leave it at 1.21. Darley remained a mainly local show until Boxing Day, 1951, when the traditional influx of interstate riders for the Victorian Grand Prix at Ballarat on New Year’s Day arrived a few days early for the Harvey Wiltshire Memorial Trophy meeting – a tribute to the former secretary of Preston MCC. Jack Ahearn and Keith Bryen from NSW, Max Stephens from Tasmania, the Tilbrook team of Rex Tilbrook and Alan Wallis from Adelaide and sidecar star Laurie Fox from Mount Gambier swelled the entry to record level, but it was still Quincey, now aboard the ex-Ken Kavangh Featherbed Nortons, who cleaned up the program. Indeed Quincey became nigh on unbeatable at Darley, one exception being the Wiltshire Trophy of 1953, when he was disqualified in his heat for receiving outside assistance (a push start) on the grid. Owen Archibald won the main race but the hero to the big crowd was Bob Mitchell, who flung his HRD outfit around with incredible verve to win the Senior Sidecar. In subsequent years, the trophy was taken out by South Australian George Crowe, Quincey, and in 1957, Trevor Pound on the 350cc Guilfoyle BSA. The venue suffered somewhat by being prohibited by the local authorities from conducting racing on Sundays, but this was finally overcome late in 1955. A huge crowd turned out to see a packed program, with Max Stephens taking the trophy for the Senior Experts Final back to Tasmania. Ken Rumble, perhaps the greatest all-round rider Australia has ever seen, was beginning to mark his mark as a road racer by 1957, and added his name to the Harvey Wiltshire Trophy in that year. Darley stole a march on the rest of the country in June 1959, when it introduced a One Hour race for standard production motorcycles. 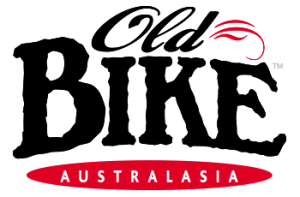 Prior to this, production racing had been seen as a soft option compared to the open classes, the main exception being the 24 Hour races at Mount Druitt in 1954 and 1955. The Darley experiment proved a success, although the 60 minute format was deemed too tedious and subsequent races were only half as long. Over the years, various high profile car racers had a crack at the one-lap record. In his Maserati 250F, Victorian car dealer Reg Hunt set a time of 1 minute 14.1 seconds in 1955, and this was subsequently lowered in 1960 by hill climb champion Bruce Walton in his Mk9 Cooper powered by a 1000cc V-twin JAP engine. Walton’s time of 1 minute 10.8 seconds (at a time when Eric Hinton and Tom Phillis jointly held the outright motorcycle record at 1 minute 13.5 seconds), remained the fastest-ever journey around the little track. South Australian Ian Hogg and passenger Peter Morgan stir up the straw as they approach Moe’s Nose in June, 1960. Kel Carruthers brought the screeching Honda 250/4 down for the 1961 Harvey Wiltshire Trophy meeting and predicably won the Lightweight race, slicing four seconds from Don Cameron’s record set back in 1955. The Production Race provided a major surprise when the unknown David Steinke, in his first road race on a BMW, totally blitzed the field, winning easily from veteran Joe Donovan on a similar machine. The new CB72 Honda twins walked away with the Lightweight division, Graeme Osborne winning from Ron Bridgeman. Carruthers fronted for the Wiltshire Trophy aboard a Vincent Comet-engined Norton, but had no answer to the flying Manx Nortons. Eric Hinton was determined to get his name on the trophy after several attempts, but Ken Rumble wanted to add his for a second time. For the entire 15-lap race the pair swapped the lead, smashing the lap record to 1 minutes 13 seconds and taking 20 seconds from the previous year’s race time. As it turned out, the final Wiltshire Trophy at Darley took place in June 1962, when Trevor Pound and Ken Rumble passed and repassed for the 15 lap journey, Pound getting the nod by a machine’s length. Both were credited with a new outright record of 1 minute 12.8 seconds. 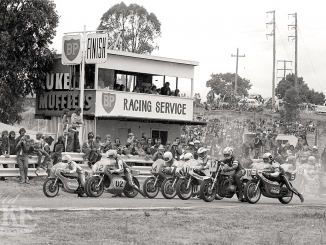 On the same day, NSW rider Vince Tierney and local favourite Allan Osborne, both on Norton 650SS twins, staged a monumental battle for the entire 30 minute Production Race. After 21 hard-fought laps, and with the 30 minute time limit just seconds away, both riders began what was believed to be their last lap. Around the back of the circuit, Tierney collided with a lapped rider on a 250, bringing them both down, while Osborne was forced off the circuit and into the bush. All were unable to restart and veteran Jack Forrest, having his last race and nearly a lap behind on his BMW, was shown the chequered flag. This result was soon scrapped by the timekeeper, Bob Payne, who claimed under the race regulations that “when the 30-minute race distance expired, both Norton riders had covered the most laps.” Forrest protested the decision but was not successful. As usual, Preston MCC made plans for the 1963 Wiltshire Trophy, to take place at Darley on June 10, with a big entry of interstate riders. At the very last minute, the owner of the property withdrew permission for the use of the circuit, saying that continual heavy rain in the area had flooded the pit and spectator areas and damaged sections of the track. The meeting was switched to Calder where Rumble had his revenge on Pound in the trophy race, with Alan Hopkins’ Norton third. Racing never returned to Darley. A combination of the primitive facilities, the narrow and uneven road surface, and the remorseless march of civilization spelled the end of the happy little track. Despite its shortcomings, the circuit had an enviable record for safety, and a reputation for slick organisation. With nary a backward glance, the infield area was soon subdivided into building lots and small farms. There’s not much of Darley left, but it’s easy to find. From Melbourne, take the Western Highway towards Ballarat until you reach Bacchus Marsh – home of the other Big Apple. Take the Gisborne Road to Darley and look for Lederberg Gorge Road on the left. The first bitumen road on the right is Cameron’s Road. Follow this uphill, downhill and finally up onto a plateau and you’re there. Look carefully about 100 metres on the right and the remnants of the final corner, often referred to as St Kilda Junction are still there, poking out from a recently-planted small vineyard. You’re now on the main straight, with the former pit area to your left. The old pits are still dotted with weathered concrete slabs from the military buildings. These were sought-after possies on race days – it beat lolling about in the mud and/or dust. The straight measures about 600 metres, and halfway down it takes a kink to the left, which would have been fairly exciting given the proximity of the trees and fence on the inside of the circuit. Opposite the kink is the monument erected to the Darley Camp itself. Anchor up and look for a set of gates on the right. The old tar, barely three metres wide, runs under it and off towards what was Gentle Annie Corner, named after the famous bend on the original Phillip Island road circuit at Cowes. The rest of the track has been devoured by subdivision and is inaccessible, unless you care to approach the owners and have a scratch around to find other traces of the road surface. One the furthest eastern point of the circuit at the sharp right-hander known as Chimney Corner or Novice’s Folly, the old chimney still stands. It takes a little imagination if you weren’t there in the old days, but if you stand on the kink and close your eyes, you can still hear the sound of a hundred motorcycles and a dozen or so cars from the 250cc and 500cc Racing Clubs, most with open exhausts, warming up. Wafting through the air is the fragrant mix of Castrol R and methanol, mingled with the aroma of Hines’ ‘Kerosene’ pies. The pointed tents of the Hines Catering Company, which is still in operation, appear in many period photos of Darley, and those who sampled the wares will tell you the kerosene stove that heated the pies produced a pastry of unique taste. A section of canvas behind the servery contained a special nook where course announcer Frank ‘Framac’ McDonald and selected others could lubricate their tonsils with a cold ale between races. Fortunately, on the run back to Melbourne, you won’t have to cope with Cunningham the Camera Cop – the notorious plod who used to hide his Thunderbird beside the old stone bridge out of Bacchus Marsh and photograph any who transgressed by crossing the double centre-lines. This article first appeared in Old Bike Australasia Issue 1.